Nguyen Hoang Phuong Thy was born in 2007 in Hanoi, Vietnam. She started learning piano at the age 4. 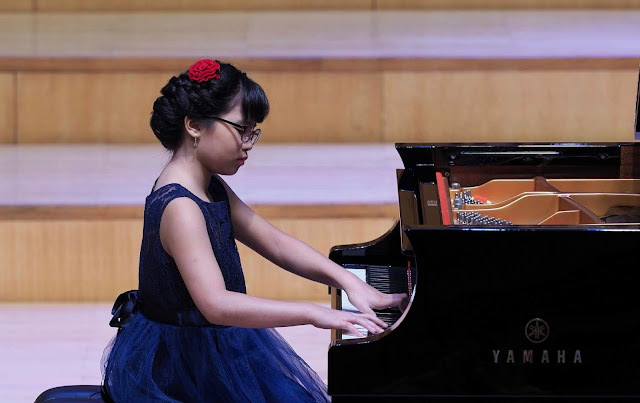 After four months learning piano with teacher, she won the Gold Prize at the Asia International Piano Academy Festival and Competition in Cheonan, Korea in 2012. Since then, she has archieved several awards in international music competitions, such as Special Prize in Valtidone International Music Competition 2014 in Piacenza, Italy; First Prize in Piano Talents 2014 International Competition for Young Pianists in Milan, Italy; Second Prize in Steinway International Youth Piano Competition 2016 in Vietnam, First Prize in Concour “Flame” 2018 in Paris, France; and other prizes in domestic piano competitions. In 2017, she performed as soloist with orchestras in two concerts in Vietnam, including Peter & The Wolf Special Concert with Hanoi Chamber Orchestra, and Music Young Talents Concert with Saigon Philharmonic Orchestra. Phuong Thy has a special love with the piano. Now she is a student of Vietnam National Academy of Music under the instruction of Dr. Trieu Tu My. She is trying her best to reach the international classical music standards.